Within the last year I've spent many hours with a hook, some yarn, and my laptop, trying to learn crochet. I've become pretty good, even great maybe, and I feel that by posting this tutorial here, I'm giving back to the greater community that taught me. So here we go. In this tutorial, I've provided the means with which to make most basic and even intermediate level projects. The videos below each correspond to a key part of crochet, with random little facts spread throughout them. I recommend if you're just starting out with crochet to watch them in the order I've presented them, otherwise feel free to skip around and pick up what you will. By the end of this tutorial, you should be able to create all the items pictured above, and much much more. Please pardon my poor language usage in these videos, I was mostly winging them when it came to their scripts. For each video I go over a key stitch, or two, as well as any other information I feel is important. I know it's probably boring to listen to, but I do try to pack as much relevant information into each video as I can. Also, please forgive all the "so"'s and random puppy noises, heh. There is a big debate among crocheters on how to properly turn at the end of a row. I'm not sure if I'm with the majority or minority in my method, but I do know I like it better. It may make a bit of a "rougher" edge, but it also doesn't leave large gaps or holes, and isn't as easy to miss (in my opinion). If you try my method and decide you want to try out the other, How to Crochet for Dummies has a great page showing you how. Also, as you'll see in Crochet for Dummies' chart, I don't chain enough before I turn when it comes to the hdc, dc, and tc stitches. This I do because my crochet is typically pretty loose, so by not doing those extra chains I keep my work a little tighter. If you're feeling your edges look awkward or slope down, try doing an extra chain (except when doing sc). In these videos I use US crochet terminology, which is different from UK crochet terminology. The titles above the videos has the English name, with the UK term in brackets. I've lost my voice for this video.. so bare with me. I'll have to rerecord it when my voice comes back. Had trouble understanding that? Me too.. so here's a good link on the differences between rounds and spirals from Knit Simple magazine: Learn to Crochet Circles. Confused? Don't feel bad, I know my techniques are a little weird. 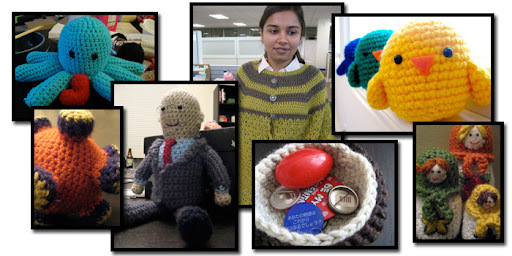 For another great tutorial on crocheting amigurumi, check out Hooks and Needle's Crochet Tutorial series. Alright, so now that you know the basics, we're going to learn something about patterns. I typically recommend for people to go small for their first projects, and I've written up a perfect pattern for it, even if it is in the round. 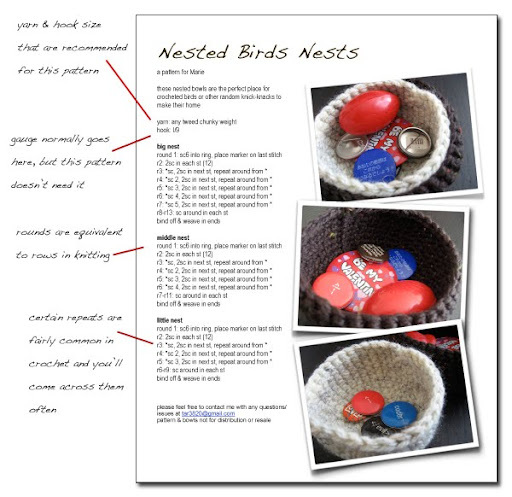 My Nested Birds Nests pattern produces three crocheted bowls that fit inside each other perfectly. Great for storing knick-knacks, change, or crocheted birds, these bowls take only a few hours for a complete beginner to make. Because I'm assuming this is your first pattern, I'm going to break it down into it's sections before giving you the download link. But I'm also rather serious, about the signing up. Ravelry is a great online community for knitters and crocheters alike. I go into more detail about this amazing resource in my post, Where I get my Yarn Geek On. Once you've tackled the Nested Birds Nests, the other pattern I highly recommend is Hannah's Birds of a Feather over at Bitter Sweet. This pattern is a good introduction to crocheting toys in spirals, and it's adorable to boot. I have every confidence that you can whip one of these adorable birdies up to go with your nests, and you'll enjoy every minute of it, too. Take note! The birds are worked in a spiral, unlike the bowls which are worked in the round. Here are some pictures of my bird as I worked on it. Hmmm.. so what else can I put in this tutorial that can help you? Honestly, I can't think of anything else except to tell you that you should be fearless. Don't approach patterns like they're monolithic beasts to be conquered by your hook. Also, don't assume you need to always follow the pattern exactly. These are your creations, make them your own. Patterns exist as a way to replicate what that person did.. but don't feel restricted to just recreating what they have done. Be creative. Make mistakes. Trial and error is fantastic! How else do you think people keep coming up with all these amazing stitches and patterns? All I'm saying is that don't limit yourself. Think you got crochet down pat? Wanna try knitting now? Check out my Knitted Pocket post for a good beginner's knitting pattern. Wanna try and mix knitting and crochet? Check out my Perfect Slouch pattern.